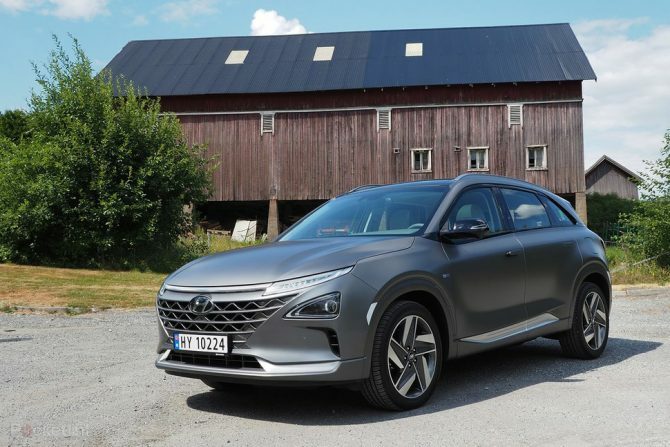 Robert Llewellyn recently had an opportunity to drive NEXO, Hyundai’s latest hydrogen fuel cell car, across South Korea. Unveiled at CES 2018 as the technological flagship of Hyundai’s growing eco-vehicle portfolio, the NEXO SUV model is set to spearhead Hyundai Motor’s plans to accelerate development of low emission vehicles. The all-new Hyundai NEXO combines the practicality of an SUV with clean advanced fuel cell technology. The NEXO is capable of travelling 609 kilometers (370 miles) on a single charge, the best among fuel cell-powered vehicles in the world. This next generation vehicle offers the most advanced technology on the market with various advanced driver assistance systems and the strongest powertrains in the segment. Hyundai NEXO achieves a maximum power output of 120 kW (163 PS) and a torque of 395 Nm. NEXO accelerates from 0 to 100 km/h in 9.2 seconds and reaches a top speed of 179 km/h. The pricing of the fuel cell electric vehicle is set at 68,900,000 KRW (51,700 EURO) for the Modern trim and 72,200,000 KRW (54,170 EURO) for the Premium trim in Korea. The Government subsidy could reach a maximum of 35,000,000 KRW (26,260 EURO), with a central government’s subsidy for fuel cell electric vehicle of 22,500,000 KRW and a regional government’s subsidy ranging from 10,000,000~12,500,000 KRW. Pricing of the Hyundai NEXO for overseas market will be disclosed at later date close to their market launches.